Want to catch up on the latest adventures of Jack and Sawyer while you’re waiting at the departure terminal? With the ABC Player application for the iPad you’ll be able to do just that. And did we mention that it is entirely free? We had an inkling that it was coming and that’s been confirmed as ABC has officially unveiled its iPad app on the App Store. ABC Player currently has about 20 of the network’s most popular shows, with the likes of Desperate Housewives, FlashForward, Grey’s Anatomy, Lost, Modern Family, and V making the list. 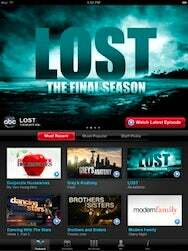 The app will allow you to browse through the shows and check out the network’s primetime television schedule. You’ll be able to watch full episodes for free, with a sprinkling of advertisements thrown in. However, video streaming is only supported over Wi-Fi. The app will maintain a history of the episodes you’ve watched and allow you to resume watching any of them from the point where you’d left off. ABC Player is available on the App Store for free and is compatible with any iPad running iPhone OS 3.2 or later.